Interested in making a restaurant idea into a reality? 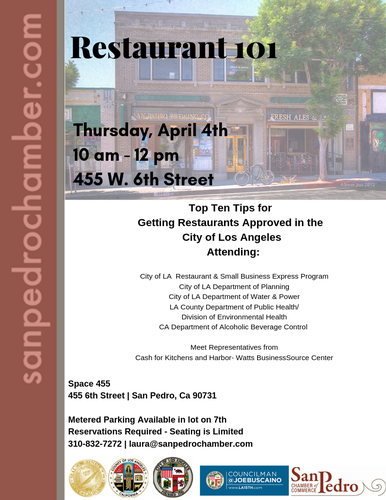 Attend the Restaurant 101 event sponsored by the City of LA Restaurant & Small Business Express Program, City of LA Department of Planning, City of LA Department of Water and Power, LA County Department of Public Health/ Division of Environmental Health, and CA Department of Alcoholic Beverage Control. The presentation provides the top ten tips for getting restaurants approved in the City of Los Angeles. Metered parking available in lot on 7th St.